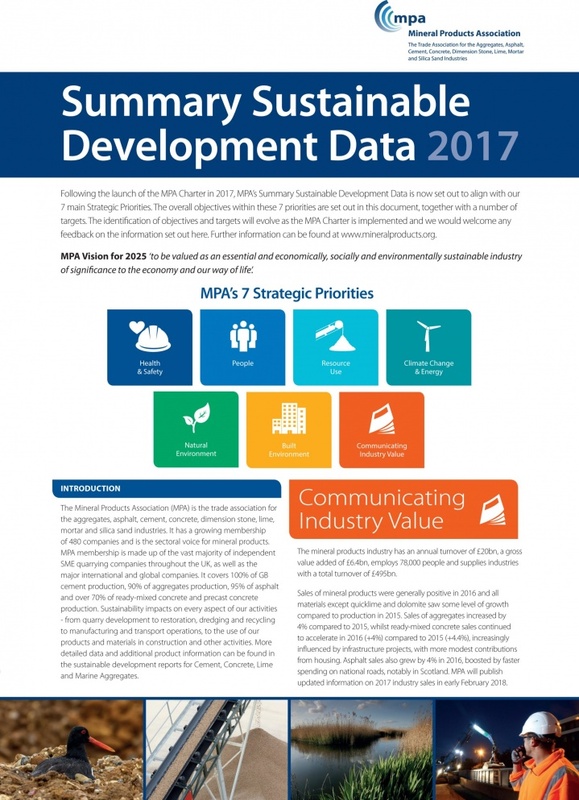 The Mineral Products Association (MPA) has published its Sustainable Development (SD) Summary Data for 2017 which covers a range of data from 2016. 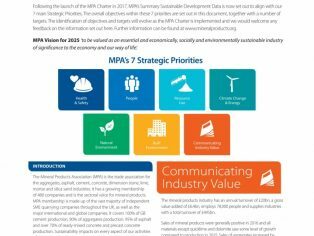 Following the launch of the MPA Charter in 2017, the data is now aligned with MPA’s 7 main strategic priorities and the corresponding objectives and targets. Recycled and secondary materials accounted for 29% of the GB aggregates market. Carbon dioxide emissions per tonne of cement production fell by 2%. CO2 emissions increased for aggregates and asphalt production and declined for ready mixed concrete. MPA recorded the creation of 6,000 hectares of priority habitat to date with a further 8,700 hectares of priority habitat creation planned. Around 30 million tonnes of aggregates were delivered by rail and water transport. The average road delivery distance for aggregates was 30.1 miles.